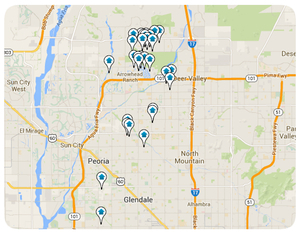 With housing in all price ranges, fine dining, art, nightlife and a hot business market, Scottsdale has it all! Scottsdale is annually ranked among the nations most desirable communities to live in. In 2014 alone, Scottsdale has been awarded 5th Best Place to Retire by WalletHub.com, Number 1 Place to Raise Children by MyLife.com, 5th Safest City in America by Law Street Media, 6th Best Run City in America by 24/7 Wall St., and boasts a long list of “Best of” titles in various categories by Phoenix New Times.